We all know you can’t have your cake and eat it, too — but who says you even need a cake in the first place? Dessert at your wedding is no longer limited to the traditional tiered wedding cake. In fact, there are many popular alternative options that are just as delicious, though maybe a bit offbeat. 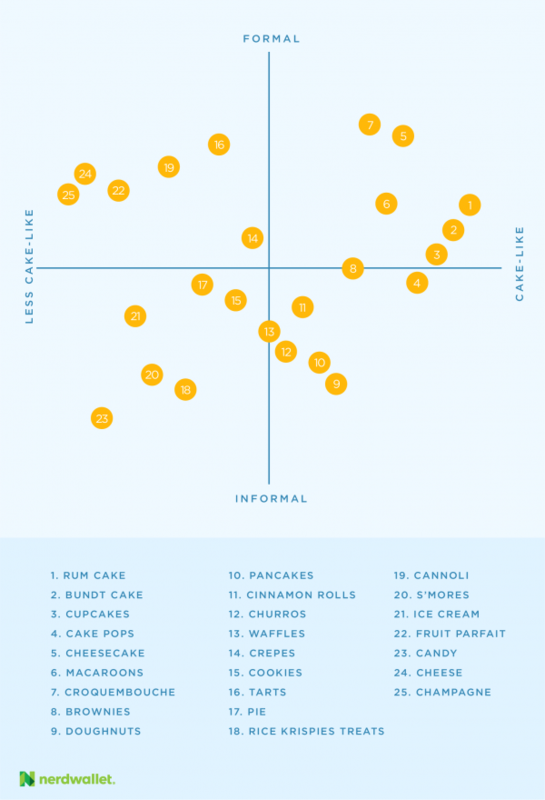 We’ve graphed (nonscientifically) some wedding cake alternatives to help you pinpoint a sweet treat to delight your guests. The desserts range from upscale to informal, and from more cake-like to less. A traditional wedding cake with structurally supported tiers and extensive decorations will be on the more expensive side, but so will a croquembouche — the traditional French wedding dessert — with the same elements.